The purpose of this thread is for anime viewers of Sword Art Online to discuss and speculate about the various game mechanics and technologies shown in the Sword Art Online anime. What do we know/have we been told about these systems and issues? Do the explanations given make sense? Are there plot holes or seeming flaws? What are the drawbacks of the approaches described, and how could they be addressed? If you wish to ask questions about the systems shown, please use the Q&A Thread. This thread is to speculate and discuss about the systems, how they are portrayed to work, and whether they are feasible in reality. This is a speculation topic, but information revealed should align with the anime airing. Any facts discussed should be limited only to the content shown in the anime. Do not give ANY future plot points away from the novels, even behind spoiler tags. If you wish to add some extra information that was not (and will not be) explained in the anime, please use properly-labelled spoiler tags (that identify the *purpose* and *context* of the spoiler). Please read the Spoiler Policy for more information. I bit curious about a trivia feature in SOA which is guild emblem, usually we draw it on separate image editor application (gimp, mspaint, pothoshop, coreldraw, etc) and upload it to the game. But ppl in SOA won't be able to do because they can't switch to another program, so SOA has a full sophisticated system for drawing I guess. 1) It intercepts signals from your brain to the rest of your body. 2) It sends signals to your brain. This seems much more plausible as a virtual world technology than Star Trek's holodeck. A fantastic part is where is kills you. Microwaves need time to fry your brain just like a real microwave needs time to heat your food. I can't see NervGear killing you in the "forced removal" scenario. It's definitely possible for it to kill you in the "you die in the game" scenario because there is no one "outside" to help you remove the NervGear (while it kills you). Another fantastic part: These people are in-game for months or even years. Are they all on IVs for food? Maybe the game has some kind of time dilation mechanism? It would be hard to prove though. I don't think NervGear only 'It intercepts signals from your brain to the rest of your body. ', one of main aspect in SOA is fighting. In fighting you'll need reflect, which is didn't controlled by brain, instead automatically done by nerve system via our backbone. So in IMO nervGear also intercept backbone nerve signal. Well, spoiler or not... if I were going to plan such a heinous scheme, I'd hide MONTHS before you do it., you know? Yeah, you'd have to be pretty stupid to get caught easily. He's basically planning a large scale terrorist attack. Wouldn't be surprised if he left the country months before release. Also, the fact that he'd given specific instructions in RL and in-game means that he's thought his idea through. 10 minutes disconnection... any attempt to tamper... it's all quite concise. No one dumb could think of more specific words to ensure that no one cheats their way out of the game. He'd have a couple of options. Hiding somewhere would give him the most freedom, and most options further on down the line, but he'd have to run risks of getting caught to get food if he hid anywhere in country, and out of country he'd risk being cut off from his ability to watch his game at work. If he doesn't care about being free after the dust settles, he could lock himself in with all the players, and leave a note for the authorities that if something happens to him, all the players would die. He'd then get to sit around as Admin watching things from floor 100, while the authorities care for his body along with all the captive player's bodies. Arrest would be certain once the game is cleared, but by then he'd have already accomplished his goal. Speaking of which, didn't the GM (creator) have no <<Log Out>> button too? Does it mean, he made his <<NervGear>> too to be the same as all the others? He seems crazy enough to kill himself along with them, but where was it mentioned that he had no logout button? I remembered that the GM's <<Log Out Button>> was the same as the others: it was unnamed. (episode 1) So I presumed it means no <<Log Out Button>>. Oh yeah, when he was demonstrating it in the beginning. I have to wonder why he bothered opening his menu at all instead of just talking about it, but yes, apparently he has no log-out button either. He basically wanted to show people that he's stuck as well, but why the hell would people notice others before himself in such a situation? Although I posted this in the episode 5 thread, it quickly got buried. 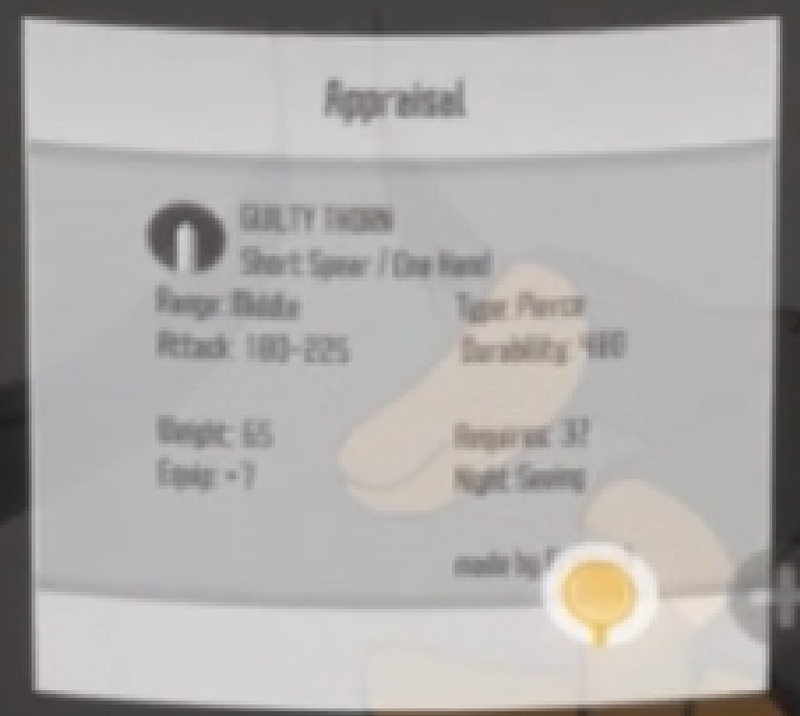 I thought it was at least useful since this is the first time we the viewer got 'info' about a weapon's stats in-game and how appraisal works. If anyone else wants to try and decipher the appraisal info, the scene with Egil happens around 13:45-13:54 during Ep5. why would he need to leave the country? We are talking about Japan where they only recently caught 2 cult leaders (who gave themselves up) after 10+ yrs. EDIT: Speaking of which, how could the NervGear and the basic conditions Kayaba applied be designed to avoid people trying to take off the <<NervGear>>? Last edited by ronelm2000; 2012-08-09 at 07:01. People in-game can't take off the NervGear because it is interrupting their brain's signals to their body. Most of them anyway. I don't really understand why you would die if someone outside the game forcibly removed your NervGear. You would only die if the NervGear was given time to kill you (with no one around to help you). An interesting thing to note is that there are no level requirements to equip gear. You probably need to specialize in certain weapons to be able to use skills with them - like a player who specializes in one-handed swords is still going to be able to wield a spear, they just can't use spear skills. The thing is, you could still learn these skills "the hard way" from a user who specializes in spears. High level skills are probably impossible for any human to actually pull off, though. I still want to see someone dual-wielding shields just because they can (a la Demon's Souls). Last edited by jcdietz03; 2012-08-14 at 13:46. Maybe it is one of those games which have a lot of pre-made guild emblems that you could choose from. Microwaves need time to fry your brain just like a real microwave needs time to heat your food. I can't see NervGear killing you in the "forced removal" scenario. What kind of sensor is placed on the NervGear? I can't think of an automatic sensor that can be placed there that is completely fail-proof of false alarms.